Please contact Debbie Barber or Nicola Elson on 01455 285655 for further details. Please note that the purchase of exclusive rights does not confer title to the land occupied by the grave or cremation plot, but the right to be buried there. Exclusive rights last for 100 years from the date of purchase and maybe surrendered at any time on return of the deed to the Parish Council Office. Please note that we can only accept payment by cash or cheques only. We are unable to accept debit or credit card payments. For guidance, monuments must not exceed the following dimensions. Burial plots - Monuments must be no more than 3 feet (0.9 metres) in height, including the base when fixed. The base must be no more than 3 feet (0.9 metres) by 2 feet (0.6 metres). To enable the ground to settle sufficiently headstones cannot be erected within 7 months of the burial, except in the case of infant burials for which headstones can be erected as soon as approval has been obtained from the Parish Council. Cremation plots - Memorial tablets must be no more than 18 inches (46 cms) thick. The base must not exceed 2 feet (0.6 metres) by 2 feet (0.6 metres). Flower containers must be contained within these dimensions. Please note that headstones, vases, tablets and other monuments must be approved by the Parish Council prior to erection. Proposed inscriptions must also be approved. Send details of your proposed monument and/or inscription (including dimensions and drawings or photographs) to the Council Office, Station Road, Broughton Astley, Leicester, LE9 6PT. 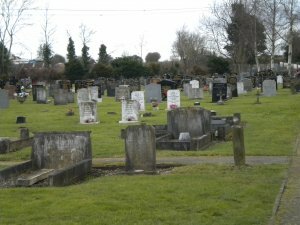 The Parish Council is responsible for grounds maintenance at the Cemetery, but new graves will be allowed to settle for six months before being levelled and re-seeded with grass. Relatives of the deceased are responsible for the upkeep of headstones and memorials. If you have any concerns about the upkeep of the Cemetery please contact Debbie Barber at the Parish Council Office (Telephone 01455 285655). 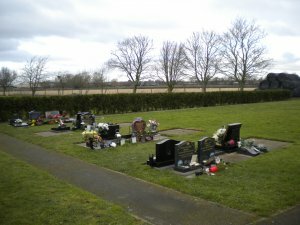 The Parish Council reviews its policy with regard to the operation of the Cemetery on a regular basis. Click on the link below to view the current policy. If you feel the policy should be amended in any way please contact Debbie Barber at the Parish Council Office. The Council Office is next to the Village Hall. The Office is open between 9am and 1pm on Mondays, Tuesdays, Thursdays and Fridays. The Office is closed to the public on Wednesdays and at weekends.